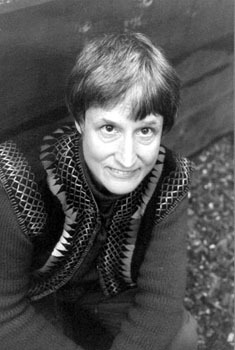 Donna J. Haraway (1944) is a Distinguished Professor Emerita in the History of Consciousness Department at the University of California, Santa Cruz. Primate Visions, 1989, Log, EPUB. 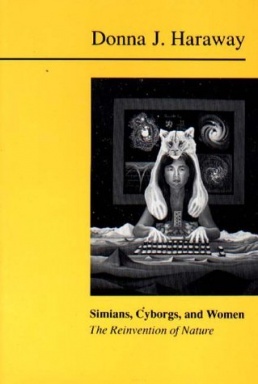 Simians, Cyborgs, and Women, 1991, Log, PDF. The Companion Species Manifesto, 2003, Log. Crystals, Fabrics, and Fields: Metaphors of Organicism in 20th Century Developmental Biology, New Haven: Yale University Press, 1976. 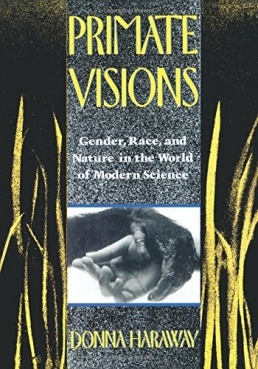 Primate Visions: Gender, Race, and Nature in the World of Modern Science, New York and London: Routledge, 1989; London: Verso, 1992. Simians, Cyborgs, and Women: The Reinvention of Nature, London: Free Association, 1991, 287 pp. Modest_Witness@Second_Millennium.FemaleMan©_Meets_Oncomouse™: Feminism and Technoscience, New York and London: Routledge, 1997, 361 pp; 2nd ed., Routledge, 2018, xlvii+374 pp. Review: Miller & Varney (Gender & Soc). _Testimone_Modesta@ Femminismo e tecnoscienza_, intro. Liana Borghi, Milan: Feltrinelli, 2000. (Italian) Introduction. 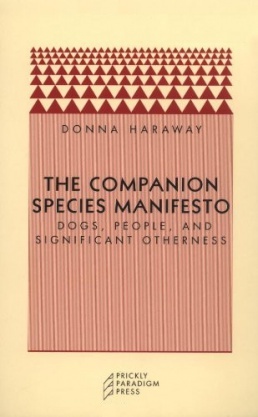 The Companion Species Manifesto: Dogs, People, and Significant Otherness, Prickly Paradigm Press, 2003, 112 pp. When Species Meet, University of Minnesota Press, 2008, 360 pp. Reviews: Margrit Shildrick (Society and Animals), Ivan Csicsery-Ronay Jr. (Humanimalia). Manifestly Haraway, University of Minnesota Press, 2016, 336 pp. Collects "A Cyborg Manifesto" (1985) and "The Companion Species Manifesto" (2003), accompanied by a conversation between Haraway and Cary Wolfe. Staying with the Trouble: Making Kin in the Chthulucene, Duke University Press, 2016, xv+296 pp, PDF, EPUB. Reviews: Archie Davies (Antipode), Matt Thompson (Savage Minds). "A Manifesto for Cyborgs: Science, Technology, and Socialist Feminism in the 1980s", Socialist Review 15:2 (1985), pp 65-107; repr. in Australian Feminist Studies 2:4, 1987, pp 1-42; repr. in Feminism/Postmodernism, ed. Linda J. Nicholson, 1990, pp 190-233; repr. in The Haraway Reader, 2003, pp 7-46; repr. in Haraway, Manifestly Haraway, 2016, pp 3-90. New version printed as "A Cyborg Manifesto: Science, Technology, and Socialist-Feminism in the Late Twentieth Century", in Haraway, Simians, Cyborgs, and Women: The Reinvention of Nature, Free Association, 1991, pp 149-181, n243-248; repr. in The Cybercultures Reader, eds. David Bell and Barbara M. Kennedy, Routledge, 2000, pp 291-324. The following note appears in acknowledgments in the 1985 version, p. 101: An earlier version of the paper on genetic engineering appeared as 'Lieber Kyborg als Gattin: Für eine sozialistisch-feministische Unterwanderung der Gentechnologie', Argument-Sonderband 105, eds. Bernd-Peter Lange and Anna Marie Stuby, Berlin, 1984, pp 66-84; the cyborg manifesto grew from 'New Machines, New Bodies, New Communities: Political Dilemmas of a Cyborg Feminist', The Scholar and the Feminist X: The Question of Technology, Conference, Barnard College, April 1983. The Haraway Reader, London: Routledge, 2003, 416 pp. "The High Cost of Information in Post World War II Evolutionary Biology: Ergonomics, Semiotics, and the Sociobiology of Communications Systems", Philosophical Forum 13:2-3 (Winter/Spring 1981-82), pp 244-278. "Signs of Dominance: From a Physiology to a Cybernetics of Primate Society, C.R. Carpenter, 1930-1970", in Studies in History of Biology, Vol. 6, eds. William Coleman and Camille Limoges, Johns Hopkins University Press, 1982, pp 129-219. "Situated Knowledges: The Science Question in Feminism and the Privilege of Partial Perspective", Feminist Studies 14:3, Autumn 1988, pp 575-599. "Deanimations: Maps and Portraits of Life Itself", in Hybridity and its Discontents: Politics, Science, Culture, eds. Avtar Brah and Annie E. Coombes, London: Routledge, 2000. "Anthropocene, Capitalocene, Plantationocene, Chthulucene: Making Kin", Environmental Humanities 6, 2015, pp 159-165. How Like a Leaf: An Interview with Thyrza Nichols Goodeve, Routledge, 1999, 197 pp. Reviews: Scott (Kairos 2000), Bourguignon (NWSAJ 2001). "Prospects for a Materialist Informatics. Interview: Lisa Nakamura and Donna Haraway", in The Politics of Information: The Electronic Mediation of Social Change, eds. Marc Bousquet and Katherine Wills, Alt-X Press, 2003, pp 154-168. Jonah Raskin, "Donna Haraway: Interview with a dog lover on a dog day afternoon", Santa Rosa Press Democrat, Santa Rosa, CA, 14 Sep 2003. Edges and Ecotones: Donna Haraway's Worlds at UCSC: An Oral History, ed. Irene Reti, University of Santa Cruz Library. 2007, 106 pp. with Noboru Ishikawa, Gilbert Scott, Kenneth Olwig, Anna L. Tsing, and Nils Bubandt, "Anthropologists Are Talking – About the Anthropocene", Ethnos 81:3, 2016, pp 535-564. Sarah Franklin, "Staying with the Manifesto: An Interview with Donna Haraway", Theory, Culture & Society, 28 Mar 2017, 15 pp. N. Katherine Hayles, "Unfinished Work: From Cyborg to Cognisphere", Theory, Culture & Society 23:7-8 (2006), pp 159-166. Margret Grebowicz, Helen Merrick, Beyond the Cyborg: Adventures with Donna Haraway, epilogue Donna Haraway, Columbia University Press, 2013, 208 pp. Reviews: Samer, Agloro, Carlson (Ada 2013), Wolters (Critical-Theory 2013). McKenzie Wark, "Blog-Post for Cyborgs", Public Seminar, 24 Sep 2015. McKenzie Wark, "Make Kith Not Kin! ", Public Seminar, 24 Jun 2016. Donna Haraway Reads "The National Geographic" on Primates, video, 1987, 28 min. This page was last modified on 2 February 2019, at 17:53. This page has been accessed 53,431 times.